A digital factory is currently being constructed at FH Vorarlberg, a leading Austrian university of applied sciences. COPA-DATA has been a partner from the beginning. We support the project with personnel and software licenses to a total value of 140,000 euros. The objective of the project is to leverage opportunities provided by modern big data processing to create durable models for automated production across locations. Technical, organizational and financial aspects all play a role. The green light was given in November 2018. Now, the next steps need to be implemented. 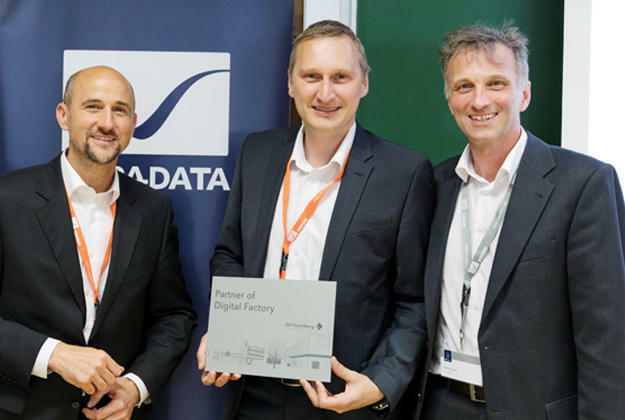 Hans-Peter Ziegler and Reinhard Mayr of COPA DATA partner with FH Professor Robert Merz (from left to right) on the Digital Factory Vorarlberg. 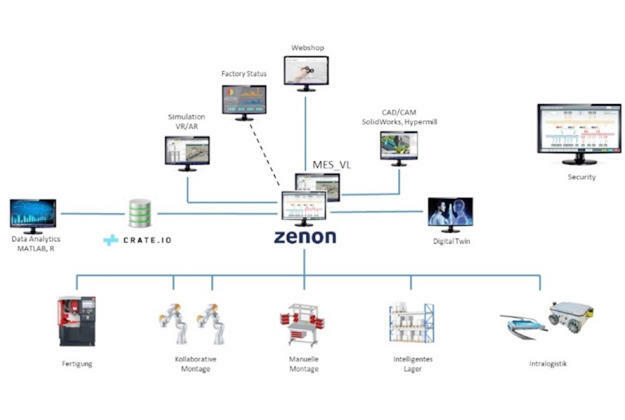 In terms of software, zenon is the core of the research and training facility. “It forms the backbone that enables the connection of our machines' control systems to each other and to production control,” explains Prof. Robert Merz, Head of the Research Factory. The infrastructure very closely replicates real-world production environments. In addition to traditional components, such as machine tools and robots, a 3D printer is also part of the infrastructure. Everything is networked and then integrated and visualized in zenon. In the future, zenon will also take over data transmission to and from an ERP system. The idea here is that two production locations are connected to each other via the cloud and production orders are distributed automatically based on factors such as the current system capacities. The project initiators view the digital factory as an open laboratory in which regional companies can collaborate with FH Vorarlberg to develop solution concepts for Industry 4.0 tasks. Thus far, we've supported the project by offering training courses for FH employees and seminars. We are also providing 25 zenon licenses for the factory and for training students. That makes a total funding value of approx. 140,000 euros. We will ensure that the research results are integrated into our product development in a timely manner in order to meet the current challenges of distributed production. zenon is at the center of the Digital Factory Vorarlberg. Other partners and sponsors include machine tool builder EMCO, robotics specialist Kuka, the Austrian Research Promotion Agency (FFG), and the European Regional Development Fund (ERDF).